Reenactors dressed in blue or gray are not the only ones who travel to Gettysburg every July. After Union and Confederate soldiers pack up camp and load their SUVs, living historians of another kind take to the field. 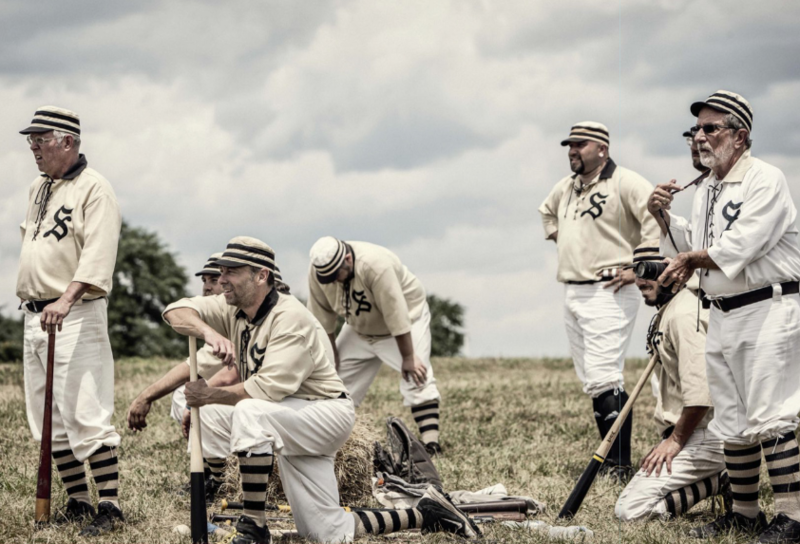 Since the summer of 2009, 19th-century base ball players have come for the Gettysburg National 19th-Century Base Ball Festival, and this year’s 8th-annual event will take place July 14-16. And, yes, that’s base ball, two words, the way it was in the olden days. Nineteenth-century base ball was played without protective equipment—no catcher’s gear, no supportive athletic shoes, sometimes no shoes at all, and no gloves. “I won’t lie. It hurts,” says Bruce Leith, promoter and organizer for the event and founder of the Eclipse Base Ball Club of Elkton, Md. Back then, athletes were not paid, for it was not yet a professional sport; African-Americans and women could play on the teams; and the rules changed—constantly. The game’s predating the Civil War debunks the myth that Union Gen. Abner Doubleday founded base ball. “Because he was their [the men’s]beloved general, a lot of friends said he started it, but it started long before,” says Leith. Many clubs such as Leith’s, founded by Union surgeons in 1866, have authentic names and are based on clubs that actually existed. Other teams have made-up names and are meant to represent 19th-century base ball. The players know the rules of the game for whatever era they represent but are well versed in all nuances and can fluidly switch eras. The athletes who come to Gettysburg every July play by the 1863 standards. This means underhand pitching and making an out either by catching a fly or by catching the ball on a single bounce, among others. In the past, Gettysburg usually drew 18 different base ball clubs, approximately 275 players, from all up and down the East Coast and the Midwest. This year, 24 teams—the maximum number allowed—will make the journey. However, this is just a small representation of what’s out there. “There are 250 teams from California to Maine,” says Leith. The appeal runs the gamut. Nineteenth-century baseball attracts every color, age, and gender. The youngest players on the Gettysburg field are in their teens, the oldest in their 70s. Dakota “Crash” Haas, 15, of Michigan, started as a bat boy on his dad’s team, the Richmond Bees, but now he’s been playing for the past five years. James “Pappy” Papineau of Michigan, 72, of the same team, has played for nine years, usually catcher. “It’s good exercise,” he says. Everyone has a nickname. “It was a custom back in the 19th-century, and we all picked up on it,” says Leith. There are also a few women on the field wearing outfits that resemble women’s Civil War uniforms. “Having women on the teams is historically accurate,” says Evette “Scrappy” Griffore of Michigan, who runs her own ladies’ base ball club, The Detroit River Belles. There were all-ladies teams back then, she says, and “Women were drawing a crowd. People paid to come and watch, so women were getting paid to play first [before men were].” All-women’s clubs do not attend the Gettysburg event, but Griffore often plays on her boyfriend’s team. This year’s festival will begin Friday night with an All Clubs Match and Kids Clinic at Gettysburg Recreational Park. The games take place on Saturday and Sunday at Schroeder Farm, 965 Pumping Station Road. Bring your picnic baskets and lawn chairs, and get ready to watch these living historians play ball! For more information, visit gettysburgbaseballfestival.com.